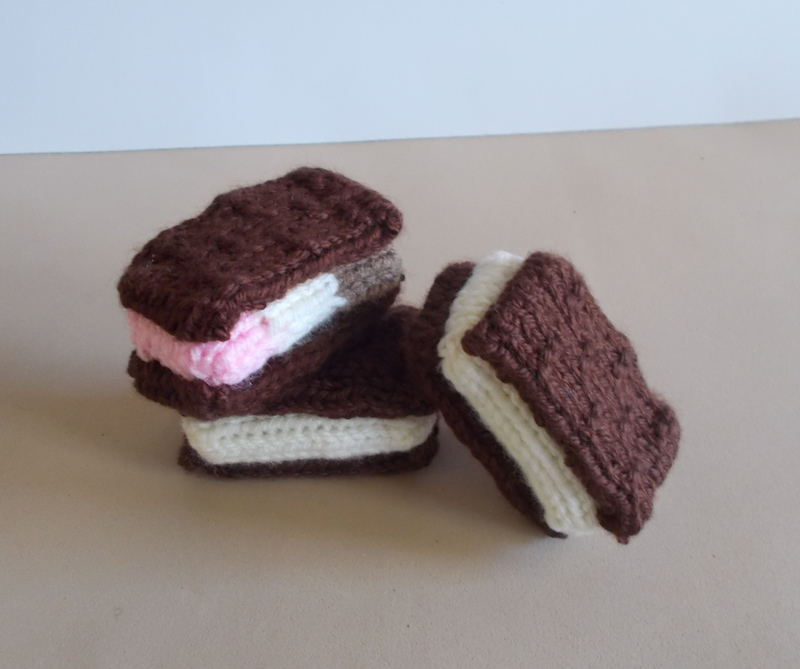 Free Pattern Fridays – Knitted Ice Cream Sandwiches! After a few weeks of vehicle patterns, I thought you might like a bit of a change! 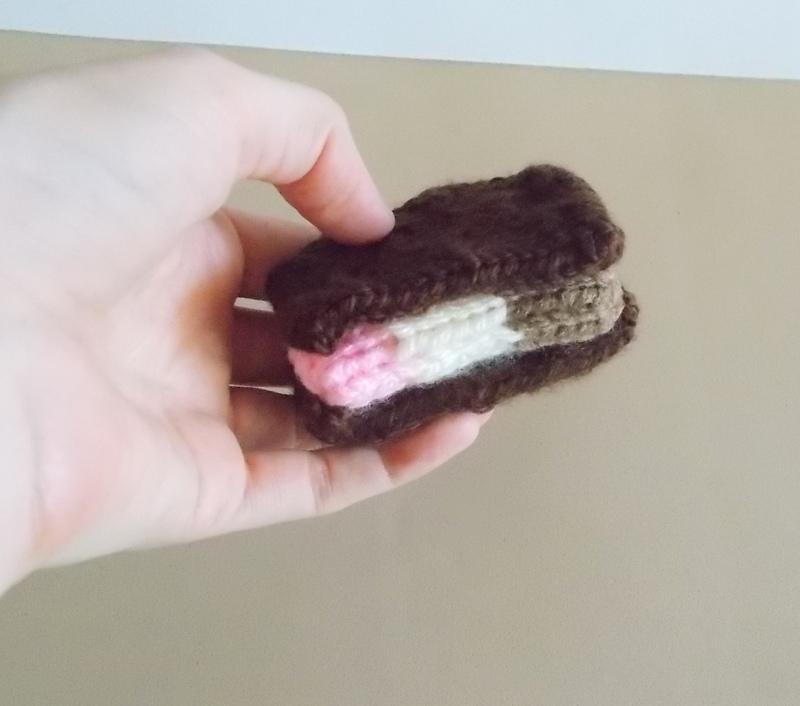 August 2nd was National Ice Cream Sandwich Day, so I thought I’d celebrate that ever-so-important holiday by knitting ice cream sandwiches! Of course, simple ice cream sandwiches just aren’t quirky enough for me, so I knew I had to do something crazy with them. 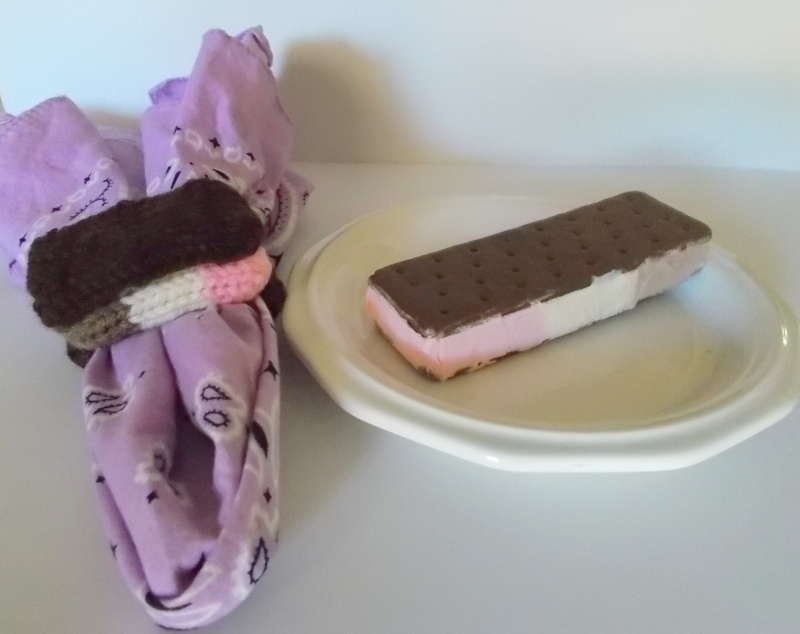 In addition to toys, I also like to make useful pieces of decoration for around the house, so my first idea when I thought about ice cream sandwiches was napkin rings. What? That wasn’t your first thought, too? 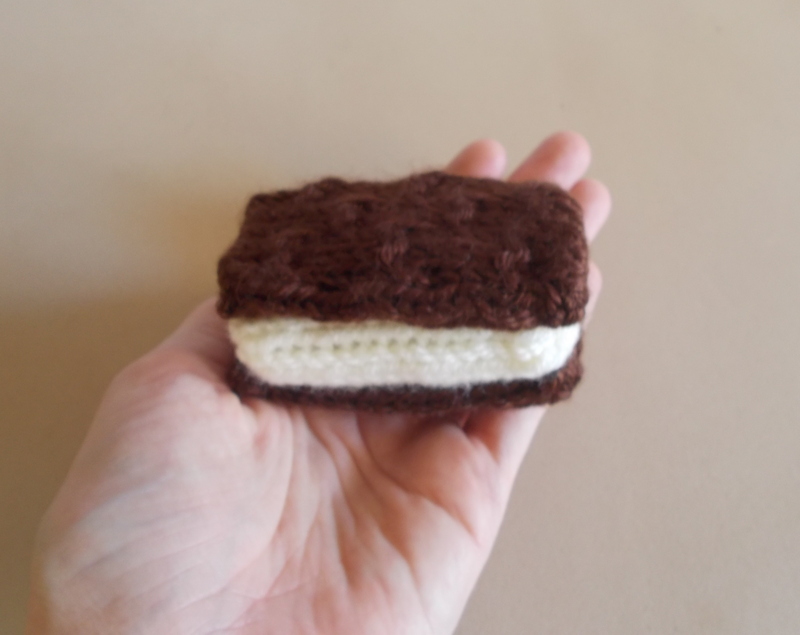 Seriously – when I thought about ice cream sandwiches, I thought about ice cream socials, kids’ parties, family sundae nights – and how I could turn these toys into something you could use at those types of parties. Simply thread a rolled or folded up napkin through the opening between the filling and the cookie and you’ve got a unique, festive adornment that the kids will love … and I think the adults in attendance will love it, too! Make the filling in the color or colors of your favorite ice cream and, if you’re feeling generous, let your party attendees take them home as a favor. If you use a washable acrylic yarn, you can simply throw them into a pillowcase and machine wash them if they get dirty – which is pretty likely to happen at an ice cream party! When you’re not using them as table décor, you can stack them up on a counter for a whimsical piece of kitchen art. The kids could also use them as a cute addition to their tea party or other fake food playsets. I was also thinking that little girls might like wearing them in their hair as a sort-of barette. I can’t test this theory as I have enough hair for 3 people and it would never fit in the slot on this toy – but if you do try it, leave a comment and let me know! Please note that if you’re using these as napkin rings, they work best with a thinner, smaller napkin. I don’t have any cloth napkins, so I used bandanas for my photos. 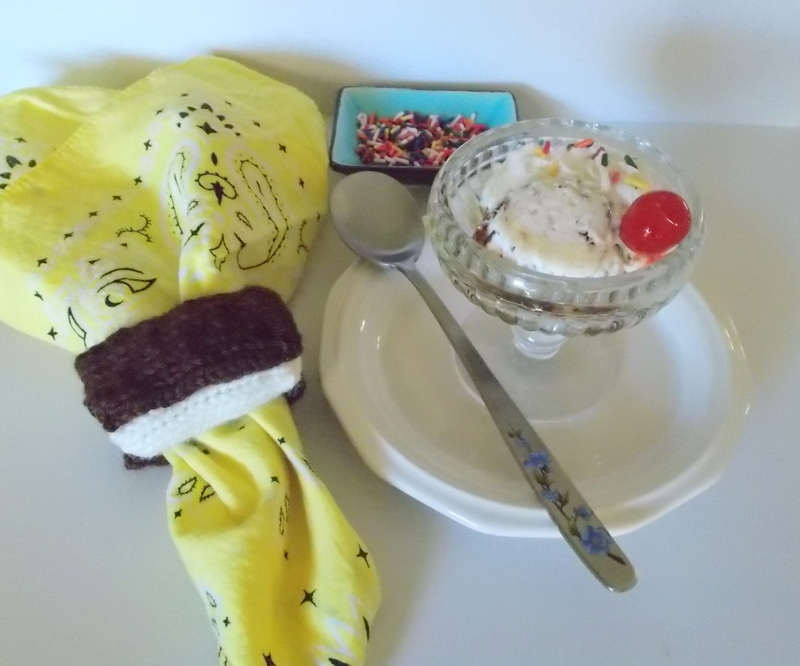 Not that there’s anything wrong with using a bandana as a napkin – they’re very multi-functional items! The napkin rings work well with paper napkins, too. 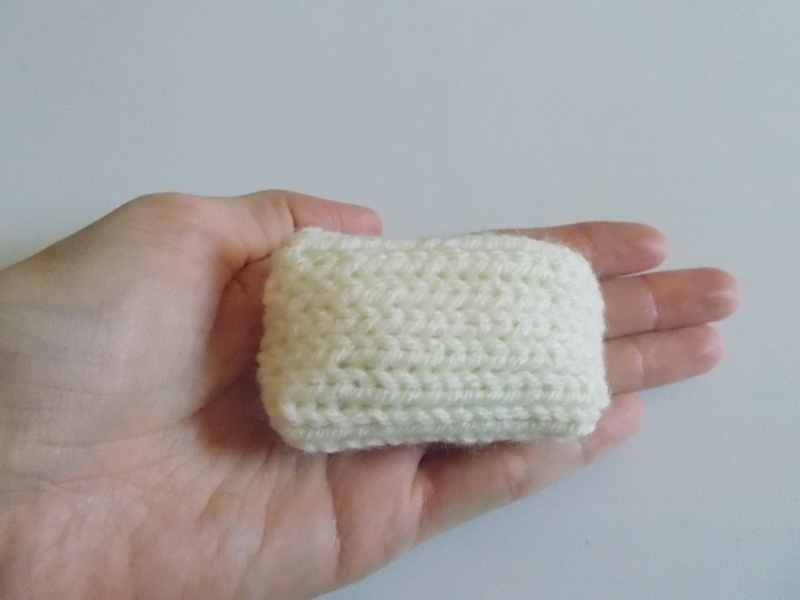 When knitted with worsted weight yarn and US Size 6 dpns, the toys measure about 2.5 inches long. 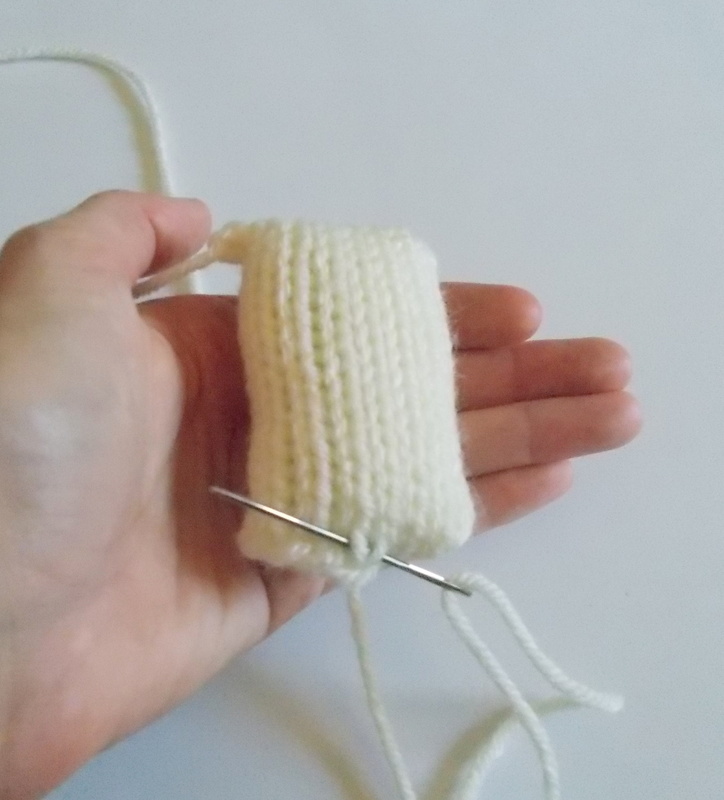 Using Cream yarn and leaving a tail for seaming, cast on 16 stitches onto 3 dpns and join to knit in the round. Rnd 1-18: Knit 18 rounds. 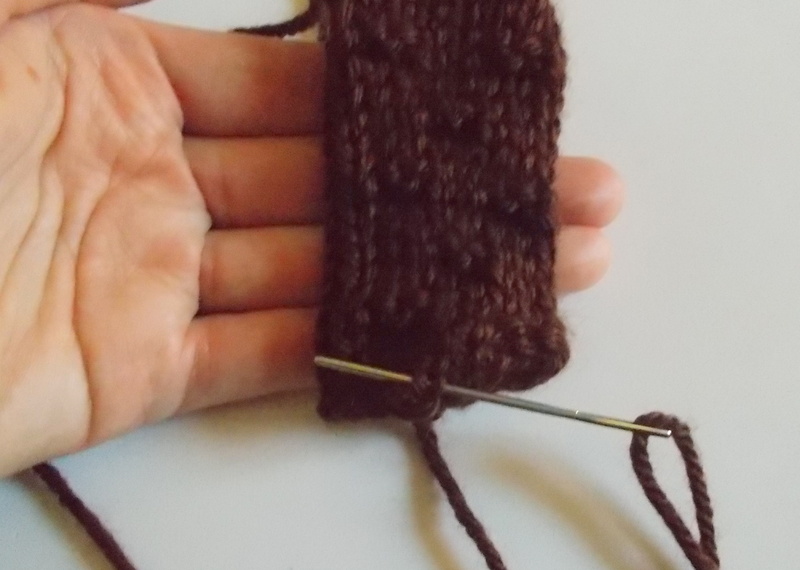 -Evenly distribute the 16 stitches onto two dpns (8 stitches per needle.) Cut the Cream yarn, leaving a tail for seaming. The tail will be coming off the rightmost stitch on the back needle. -Seam the two sets of stitches using Kitchener Stitch. -Stuff the ice cream filling piece through the open cast-on edge, then use the cast-on tail to seam the opening with Mattress stitch. 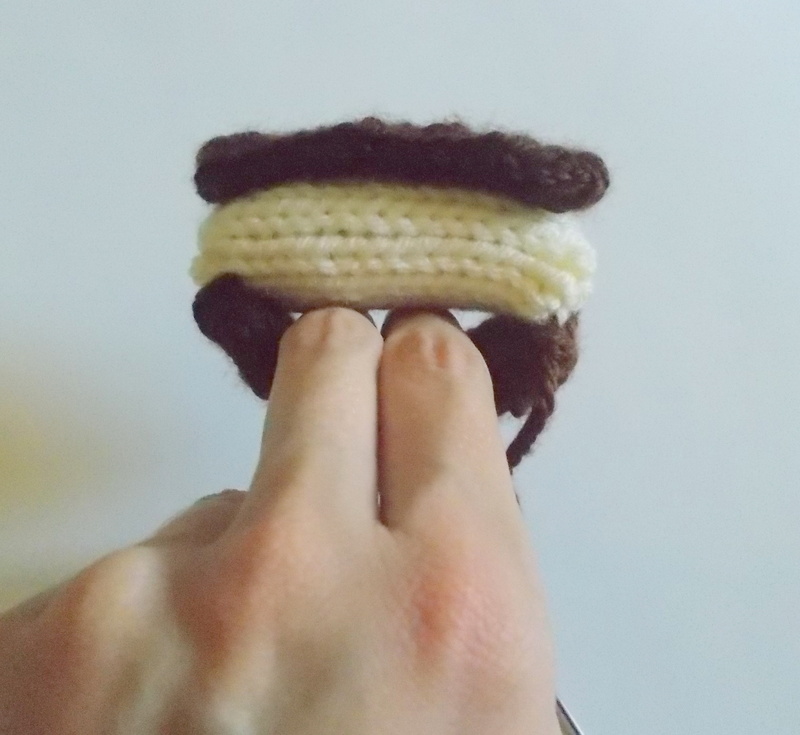 Using Brown yarn and leaving a long tail for seaming, cast on 16 stitches onto 3 dpns and join to knit in the round. Rnd 1-3: Knit 3 rounds. Rnd 8-9: Knit 2 rounds. Rnd 10-15: Repeat Rnds 4-9 one more time. Rnd 16: Repeat Rnd 4 once more. Rnd 17-19: Knit 3 rounds. -Cut the yarn, leaving a tail for seaming. Distribute the stitches evenly onto 2 dpns (8 stitches per needle) with the tail coming off the rightmost stitch on the back needle. -Seam the two sets of stitches together using Kitchener stitch. -Seam the open cast-on edge using mattress stitch. No need to stuff the cookie. -Make a second cookie in the same way. Do not weave in the ends just yet. -Place a cookie piece on top of the ice cream filling. The long edges of the cookie should line up with the long edges of the filling and the purl bumps should be facing outward. -Place the other cookie piece on the opposite side of the filling piece, again with the purl bumps facing outward. 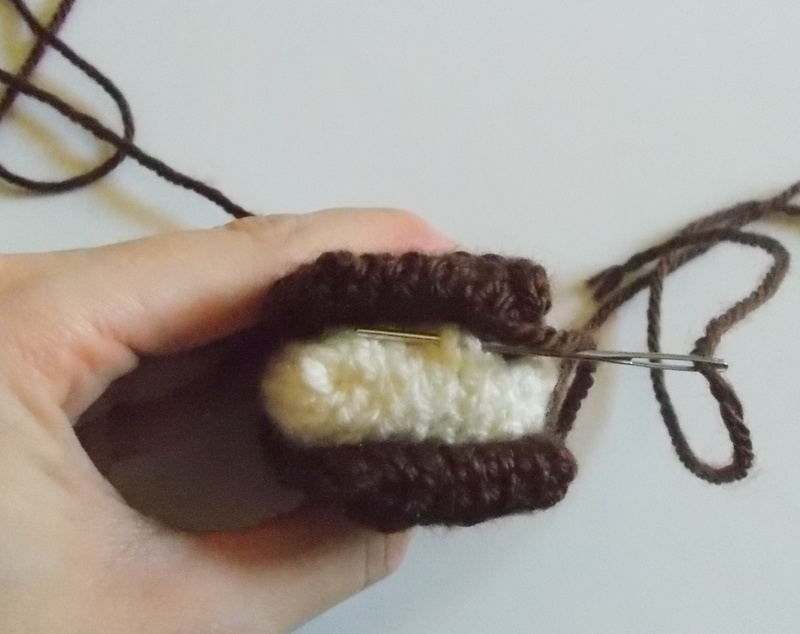 Thread one of the tails into a tapestry needle and stitch only the short edge of the cookie to the short edge of the filling using mattress stitch. -Repeat to attach the other side of the bottom cookie. -This will leave a gap between the bottom cookie and the filling that you can put your fingers through. -Weave in the ends. Make sure you don’t weave any ends through the unattached portion of the bottom cookie – rather weave them into the filling along the edges of the piece and weave through just the filling several more times before cutting short. -If you want to use these as simply a play food toy, you can stitch the bottom cookie snugly to the filling as you did for the top cookie. 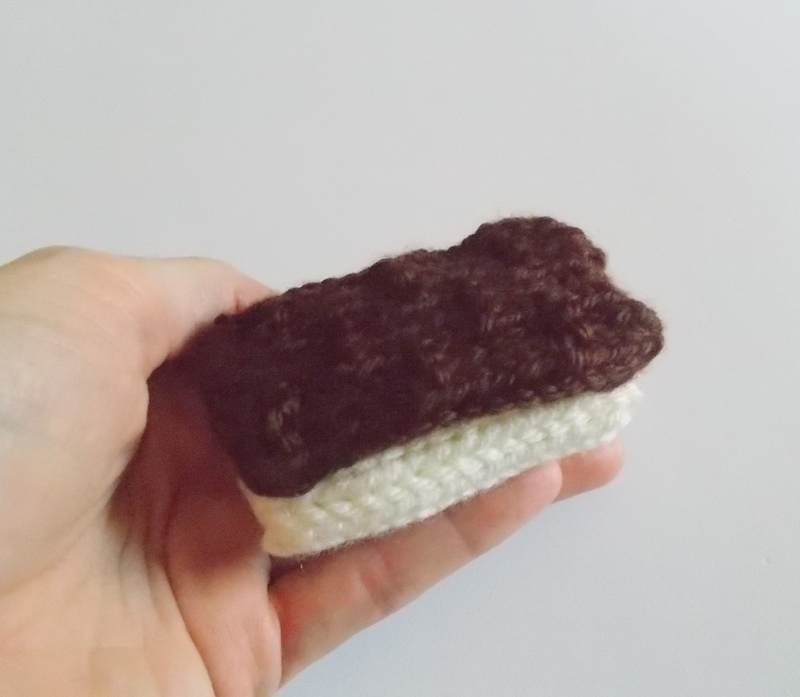 To make a Neapolitan ice cream sandwich, cast on the filling section with a light brown yarn, knit 6 rounds of brown, then switch to cream and knit 6 more rounds. Finally, switch to pink and knit a final 6 rounds. Proceed to finish as for the vanilla ice cream filling. 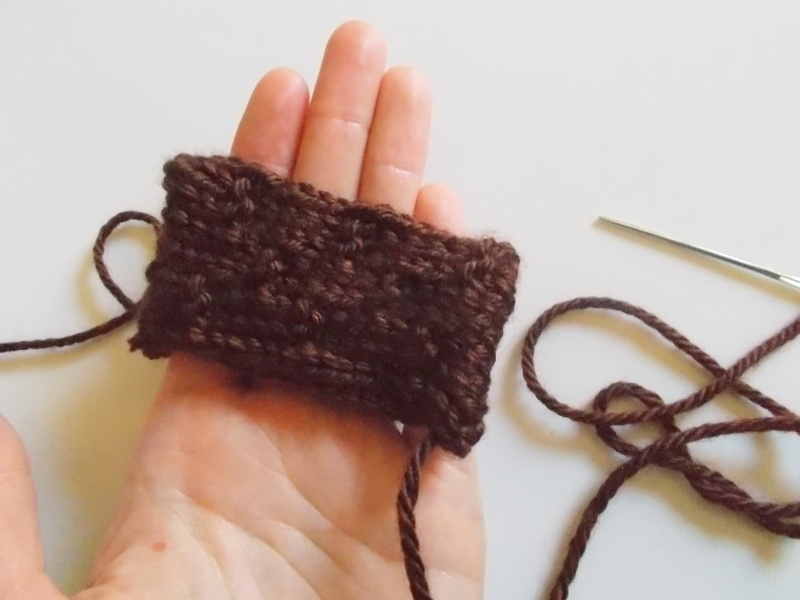 You can minimize the “jog” between the color changes by knitting one round with the new color, then slipping the first stitch of the next round and proceeding to knit around as before. Thank you for stopping by – I hope you enjoyed this week’s pattern! 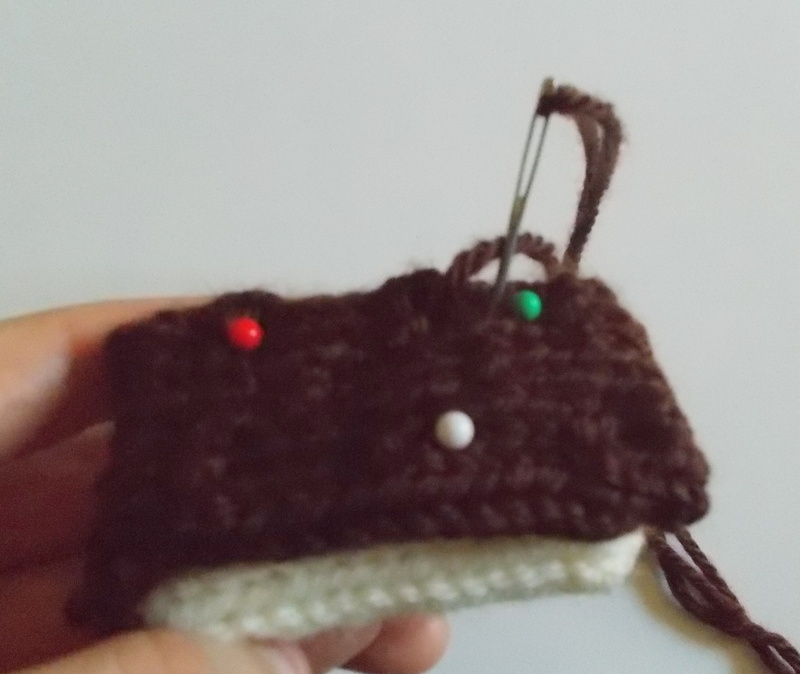 If you have any suggestions for future Free Pattern Friday items, feel free to contact me by leaving a comment on this blog or messaging me on Ravelry or Etsy! I’d love to hear from you! Have a wonderful weekend!